For Musicians Only: New Black Cat Ladies Tees! We just got a new shipment of Black Cat t-shirts with a new design. Not only that, but this time we ordered some for the ladies as well. We've gotten many requests for Black Cat ladies tees; one of those requests came from our own Black Cat Sara, who couldn't wait to try hers on. The new black shirts we got all have the new graphic (we have some of the old black ones leftover in XL and 2X). The new ash gray shirts still have the original graphic. 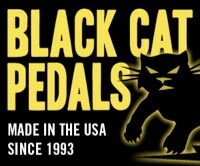 Black Cat Pedals t-shirts are available now at the FMO Gear Shop (click link).